Madam, you want to go spinning?" I was seated in a coracle—a floating basket made of bamboo, cane and plastic—when Devraj, the boatman, broke my reverie. I had barely managed to nod before he started paddling faster towards his right and I was treated to blurry views of the sunset merging with huge boulders. Devraj stopped, grinning at my dishevelled but delighted look. I made a mental note to tell people I had tried spinning in the Tungabhadra river in Hampi, even though it wasn’t the popular fat-burning workout. Hampi is a Unesco World Heritage Site, with temples and monuments dating back to the 14th century Vijayanagara empire. The marvellous temples, some in ruins, emerge from the surreal landscape of pale brown boulders, with the Tungabhadra running through. With only a weekend at hand, I decided to tick the prominent ones off my list before taking a detour to the neighbouring village of Anegundi. Earlier in the day, I had climbed the Hemakuta Hillock for a bird’s-eye view from “sunset point". It was noon, and the sun was beating down. I trekked up the steep pathway, for a grand view of the town spread around the Virupaksha temple. I walked down towards the majestic temple, one of the oldest in India, known as much for the resident elephant Lakshmi as for its nine-storeyed entrance tower. I spent much of my visit looking up, taking in the intricate murals of Vishnu’s incarnations and other celestial beings. Next on my list was the iconic Vittala temple, known for its 56 pillars that produce musical notes when tapped. Visitors aren’t allowed to touch them but my guide, Santosh, took me to one of the smaller halls with similar pillars, which did not have any tourists. I gently tapped them, pressing my ear against the cool stone, safe in the knowledge that no one could hear my off-rhythm tunes. A few kilometre away, while exploring the zenana enclosure, or women’s quarters, in the Lotus Mahal complex, I came across a museum run by the Archeological Survey of India. It’s housed in a corridor, open to the skies and lit by the warm glow of the afternoon sun. There, I found carved statues of Hindu gods and mythical creatures—all artefacts from the Vijayanagara empire. The next day, I visited the historic village of Anegundi, 20km from Hampi. The village, Santosh told me, is also believed to be part of the monkey kingdom of Kishkinda that features in the Ramayan. I did see a few monkeys bounding about, impervious to the mythical past, and the Anjanadri hill, believed to be the birthplace of Hanuman. I then stopped at the nearby Onake Kindi, home to rock paintings dating back to the Iron Age. A solitary man “guarding" the open-air ancient exhibition pointed me in the right direction. I squeezed into the narrow space surrounded by boulders for a glimpse of community life from centuries ago: cattle, people dancing, weapons, hunting scenes, symbols, even an ancient burial ritual. After my tryst with history, I visited a banana- fibre workshop in the village. Run by the Kishkinda Trust that works for heritage conservation in the region, it teaches craft to local woman and then employs them. The banana fibres are twisted and turned into coir and then shaped into mats, hats, bags and coasters, among other things. On the way out, I even ran into a celebrity: the Kannada actor Rajkumar. It was a statue of him playing the role of the emperor of the Vijayanagara empire, Krishnadevaraya, in a movie. It seemed a fitting end to the trip—encountering a king in a once-royal city. 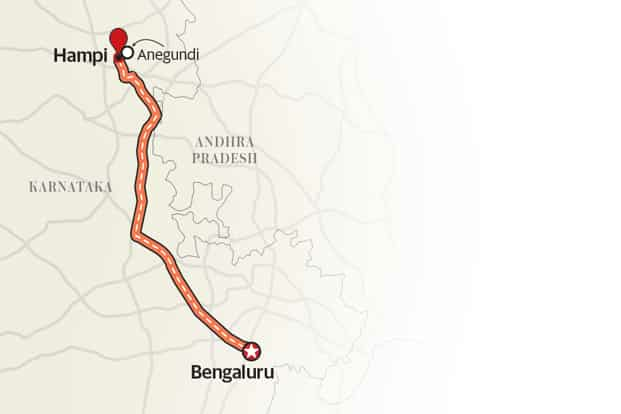 Route: Drive down National Highway 48 (the old NH4/ also called Tumkur Road) out of Bengaluru, to Chitradurga. From the Chitradurga bypass, take NH50 for Hospet. Hampi is about 13km from there. Stay: Mowgli Guesthouse (www.mowglihampi.com); tariff, non-AC (double occupancy), Rs1,800-2,000, excluding meals. Top tip: Visit the Daroji Bear Sanctuary, 20km from Hampi, to see sloth bears. Entry fee, Rs50; timings, 6am-6pm.